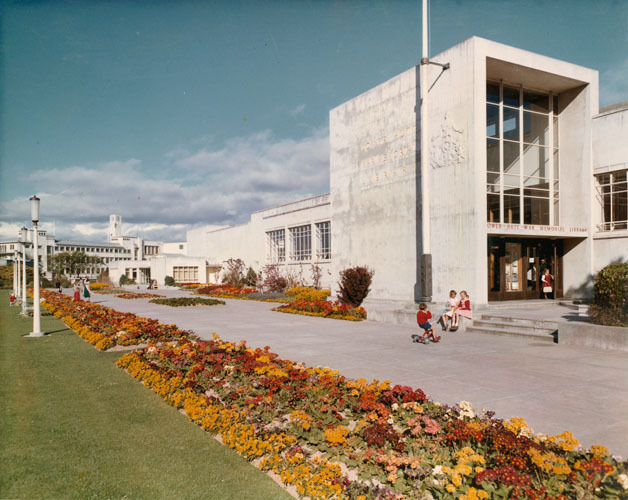 The War Memorial Library is one of the four buildings that form the Lower Hutt Civic Centre. The others are the St James Church, the Town Hall and the Horticultural Hall. J.W. Andrews the mayor of Lower Hutt from 1933 to 1947 initiated plans for a modern civic centre. He recognized that the existing facilities were woefully inadequate. His successor Percy Dowse oversaw the implementation. The Library was designed by Ron Muston. He was responsible for the St James Church which opened in 1953 and was directed to design the Library in a style that was compatible with it. Both buildings follow Modern Movement principles. Construction began in 1952 and the building opened in 1956. Initially estimated to cost 100,000 pounds the actual cost was double. The government contributed a quarter of this through their war memorials programme. The rest of the funding came from the Council and the public. Money was raised through events such as an Easter carnival. The Council produced a booklet, We will remember them, to encourage donations. Many memorials were constructed in New Zealand immediately after the War however it was unusual for these to take the form of a Library. In Lower Hutt the Council was determined to provide something that was both useful and symbolic. Besides being a significant example of modernist architecture, the Library is also noteworthy for three large murals inside. These were the work of Wellington artist Leonard Mitchell and depict the sufferings of war and the way of life that that the War was fought to preserve. Ian Bowman (2002). 1950’s buildings : Lower Hutt City’s post-war Modern Movement buildings. Ian Bowman (2003). Lower Hutt Memorial Library conservation plan. Julia Gatley (2008). Long live the modern : New Zealand’s new architecture, 1904-1984. David McGill (2005). Landmarks : notable historic buildings of New Zealand. David McGill (1991). Lower Hutt : the first Garden City. Chris MacLean and Jock Phillips (1990). The Sorrow and the pride : New Zealand war memorials. David Millar (1972). Once Upon a Village, a History of Lower Hutt, 1819-1965.